Squarespace has just announced a brand new version of its product called Squarespace 7. Obviously, the interface of the service (which gives users a full suite of site publishing/e-commerce tools) looks refreshed, but it’s the new features that really differentiate between this and Squarespace 6, launched all the way back in 2012. For instance, Squarespace 7 now offers a side-by-side view for the interface and the content, letting you make changes to the website with a live preview as you’re doing it. This is a big leap from Squarespace 6, where users were editing their site blindly without looking at what the site actually looks like. Going beyond a split screen/live preview editing experience, the new Squarespace also offers little annotations on the actual website at any given time, so you can click on any editable element and make a change without ever using the site manager. Another interesting editing tool is called “device view.” This allows the editor to resize their desktop browser window and automatically see the way their website looks on any given device. 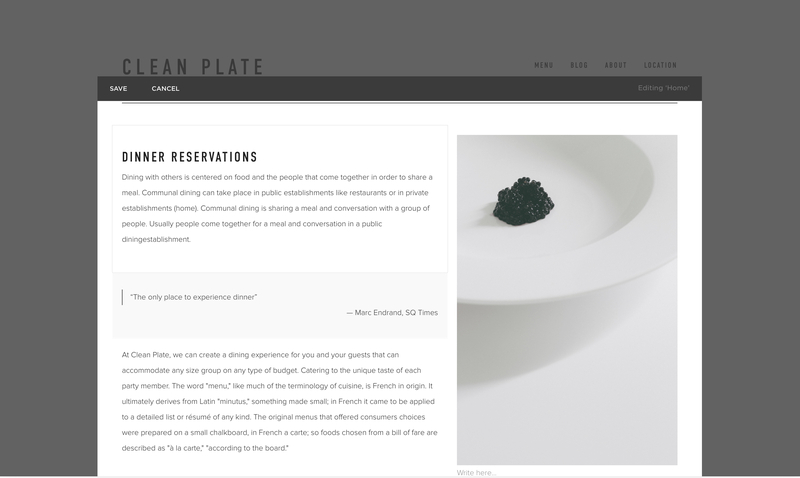 As the window gets smaller, Squarespace 7 automatically resizes the site down to an iPad view, and then an iPhone view. Squarespace is also announcing an integration with Getty Images, giving users access to tens of millions of images to use on their website for just $10. At the live press conference, this addition got quite the round of applause. The company is also integrating with Google Apps. This will let users set up email accounts, schedule events, etc. Alongside the launch, the company has unveiled 15 new category templates for niche websites focused on various verticals, such as weddings or restaurants. Plus, people who need to build a one-off page, splash page, or cover page now have a brand new tool to do so. Squarespace 7 includes a splash page builder with 10 new templates of its own, which can be added to any existing Squarespace site. The launch of Squarespace 7 also marks the official beta exit of the company’s developer program, meaning that the platform will only continue to get more robust as more developers sign on. Squarespace was founded all the way back in 2004, but has truly found its stride in the past few years. At the Superbowl last year, Squarespace was one of the smallest companies (relatively) to have a commercial during the big game. And in April, Squarespace pulled in another $40 million in funding, bringing that to $78.5 million raised in total. The company has also singed a lease on a 100,000 square foot space in the West Village as a new headquarters.